The Falany Performing Arts Center is built on the classic Greek axis, located across from the Fincher Visual Arts Center, on the Reinhardt University campus. 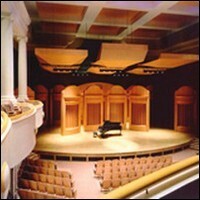 The Center houses the School of Communication Arts and Music and provides a showcase for programs underlined by academic quality and a strong liberal arts tradition. Since opening in 2002, the Center has hosted a variety of events that enhance the knowledge, enjoyment and experiences of its students and community.